Punctually at 8pm, the designated start-time, Low seated himself upon a chair beside a floor lamp, put on his reading glasses like a university professor about to embark on his lecture, and started his ArtScience Late session. Of course, this was no lecture, but an intimate evening of heartfelt songs buoyed by dexterous acoustic strumming. Clad totally in black, he launched into the first song, ‘Balm for the World’, the opening track off his latest album, Child of the Island, one of his four releases in 2017. Many of the songs performed are from the 2017 album, Nature, like ‘Homecoming’, ‘The Moon is Beautiful’ and ‘Magic’. 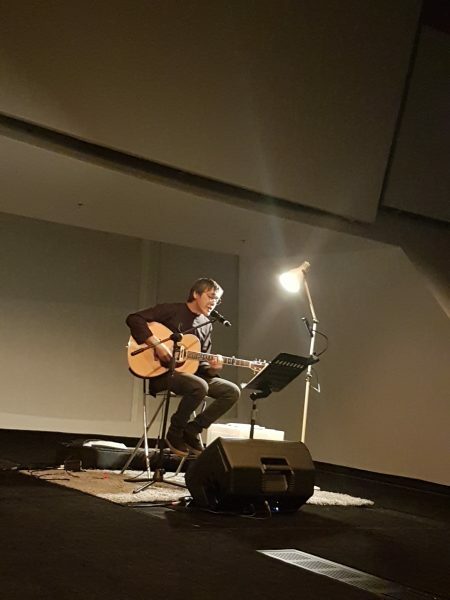 Low kept his banter between songs to the minimal, but he did share some background info on how certain songs were written, like how ‘Days of Endless Rain’ were inspired by a rain that lasted for two days. Or how another song ‘Singapore in My Bones’ was written after a sudden surge of homesickness hit him while he was travelling. As the gig’s sound design was tasked to veteran musician and sound engineer Shah Tahir, who used to play guitar for the Singapore band Heritage, it was fitting that Low should cover a Heritage song, ‘Fighting the World’, which he dedicated to the band’s lead vocalist, Ashley Jansen (who incidentally couldn’t make it to the gig as he wasn’t feeling well). After a 10-minute intermission at 8.55pm, Low returned to perform ‘Life’s Forces’, followed by other songs like ‘Easier Said Than Done’ and ‘The Turncoat’. In this second part of the gig, fans of Humpback Oak were also treated to his rendition of ‘Lower Girl’ (from his former band’s 1994 album, Pain-Stained Morning) and ‘If I Am Weak’ (from 1997’s Ghostfather). After showcasing a new song, ‘Let It Be’ (no relation to the Beatles classic), he ended his session just before 10pm with ‘Gatherer of Moss’ (from his 2017 album, To My Shadow). Perhaps, one highlight of the show was the performance of ‘To Live Like the Sea’ (with the memorable lyrics of “Ships have no voices, just a lonesome illusion…”), prefaced by the familiar strains of folk song ‘Di Tanjong Katong’ and then tagged on later with his rendition of ‘Shanty’, the 1960s pop instrumental by Singapore band, The Quests. Ultimately, what this almost-two-hour session achieved was not only to revel in Low’s affinity for folk-rock tunes that he is so adept at. More importantly, it once again reminded the audience that here’s an earnest singer-songwriter, deeply Singaporean at heart, who never stops using personal, contemplative musical outpourings to ruminate on what it is like to live, and to survive, in this urban/natural city state we call home.